It must be about fifteen years now since the first time I became aware of Carrie; she was on her first overseas tour with Chip Taylor, providing some beautiful violin playing and a few harmony vocals in support of Chips lead vocals and guitar. It was in a small pub in Brighton and was immediately obvious that the young Carrie was shy and lacking in the confidence needed to push herself to the fore, despite her abundance of talent. The years she spent with Chip on tour and recording four high quality albums boosted her confidence to such a degree that when I saw her with her own band a few years ago her confidence and ability to project herself seemed boundless. On first listen to her first solo album, the 2006 release, 'Seven angels on a bicycle' it was obvious she had learnt and developed to such a degree that she was going to be a hugely successful 'roots' music artist. And so it has proved with this, her sixth solo album, during which time there has been another release with Chip Taylor and one with Ben Kyle. She is a native of Austin, Texas and as such has absorbed both country and Mexican influences, in fact her great aunt was acclaimed Chicana singer Eva Garza, a huge influence that is there for all to hear on this gorgeous recording. The songs are sung in a mix of English and Spanish, with some of the compositions coming from the pen of Mexican writers, including three by Cuco Sanchez, Carrie has five co-writes, including two with partner and multi instrumentalist Luke Jacobs and there is one of which she was sole writer. So, the songs are wide ranging and mainly played at a slow to mid tempo on this always eventful album that flows beautifully and is a satisfying listen from first play onwards, eventually taking on a warm comforting feel. There is now a lovely warmth and a mature sensuality to Carrie's vocals as the shy young support artist has been left behind and life has given her the confidence to develop her totally natural and hugely appealing style. As a consequence her music is just about close enough to the mainstream to sell very well but adhering to and staying true to those Tex-Mex roots is far enough away to appeal to those who like their music to have an 'edge.' That is something that indicates a follower of her own muse rather than trying to sanitize her work for mainstream approval. I'm sure she would like the benefits the mainstream can provide but she is not prepared to compromise her musical direction in the process. Her virtuosic violin playing is not quite so evident on this lovely album but it was always likely that as she developed musically she would not have to be quite so reliant on that discipline, instead using her lovely, expressive vocal pipes to define her talent. A nice 'twangy' guitar sound leads into Carrie's sultry expressive vocal on album opener Perfidia, a 'classic' song sung in Spanish but including a beautiful steel guitar for good measure! 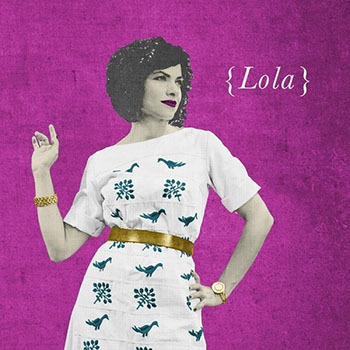 There is a quite spooky arrangement on I Dreamed I Was Lola Beltran an excellent English language song from which the album takes its title. The haunting steel guitar offers beautiful support to Carrie's lead vocal, which is at its expressive best, with excellent solid rhythm guitar laying a foundation on which the melodic guitars are allowed to float in and out of the song. Carries lovely meandering violin is the lead in to the dramatic Spanish language song Frio en el Alma, with chirpy percussion and handclaps and a deep twangy guitar to complement Carrie's expressive lead vocal. Frio En El Alma has an arrangement that edges towards a swampy roots rock sound on this Carrie penned tale with the drama deepening when her violin is introduced perfectly contrasting with the chunky guitar sound, although whilst having that rootsy rock feel the song never strays too far from its country roots. Final mention goes to Noche De Ronda on which another deep twangy guitar is included on this excellent Spanish language song that perfectly suits Carrie's sensual, expressive evocation on an intensely dramatic tale. With Linda Ronstadt no longer able to record, Carrie has all of the talent and versatility required to step into her position as one of the great roots singer songwriters and one who could conceivably be accepted by the mainstream. A huge talent, who with this album has cemented what most fans suspected already, and that is that she is not only unafraid of those roots but she is now a great interpreter of them, whichever side of the border they are found.